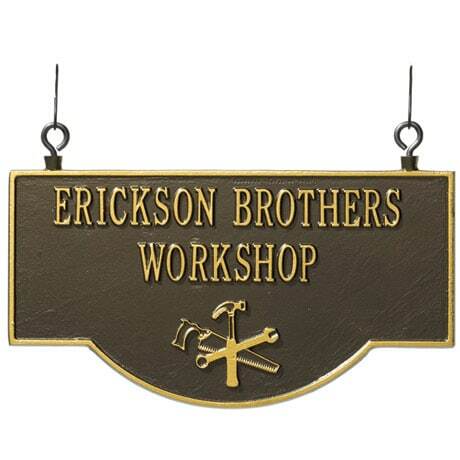 This handsome, double sided, aluminum sign (VD0142) �is completely weatherproof and crafted with details that even the fussiest handyman will approve of. The rugged saw bracket (VD0152) is a hilarious and stylish touch he'll love. Sign is 9 1/4"H X 15 1/4"W; bracket is 8"H X 17"W. Specify two lines, up to 17 characters and spaces each. UPPER CASE letters only. Please allow 3-4 weeks for delivery. Sorry, no rush delivery or gift bag available. Sold Separately. Made By Whitehall.